> Wellspring > Tech Scouting Programs: Build or Buy? Technology and R&D leaders contend daily with the daunting pace of technological change in their core products and platforms. Recognizing both new tech opportunities and disruptive threats, many managers have responded with tech scouting and tech landscaping programs. Building on these efforts, in the past few years a new mainstream has begun to adopt tech scouting as a mission-critical competency. 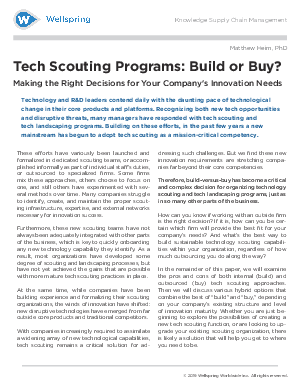 Download this paper to learn how we examine the pros and cons of both internal (build) and outsourced (buy) tech scouting approaches. Then we will discuss various hybrid options that combine the best of “build” and “buy,” depending on your company’s existing structure and level of innovation maturity.